Posted byPaul	 March 29, 2014 March 29, 2014 1 Comment on High Variety. 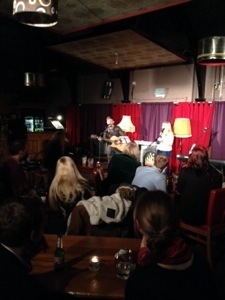 Last night I hosted the first Six Presents High Variety show at The Alex in Southend. It was an evening of stand up comedy, songs, juggling, escapology and improvisation. It was absolutely fantastic. I can’t think of a time when I enjoyed being on stage so much. It was made all the better by the performers so before I get into the nuts and bolts of the thing I would like to thank Sam, Cat, Ben, Ross, Justin, Adam, Lance, Jack, Jamie and Luke for the parts they played in it being a success. I find it incredible that I am surrounded by such talent, that within our little corner town there is such skill and magic, and that there is obviously an audience for it. Those who joined us last night were patient and true. When I tried to tell jokes or play the piano they stuck by it and saw the whole thing through. I feel truly blessed for being a part of the show and the success I feel it to be. The Stamp Collective – an excerpt. Nice shot of the back of my head!